The 2019 OFA Annual Meeting is now behind us, and we move our focus to the Ohio Hardwood Furniture Market, Camp Canopy, the Summer Meeting, and the Paul Bunyan Show. But what a good meeting it was! 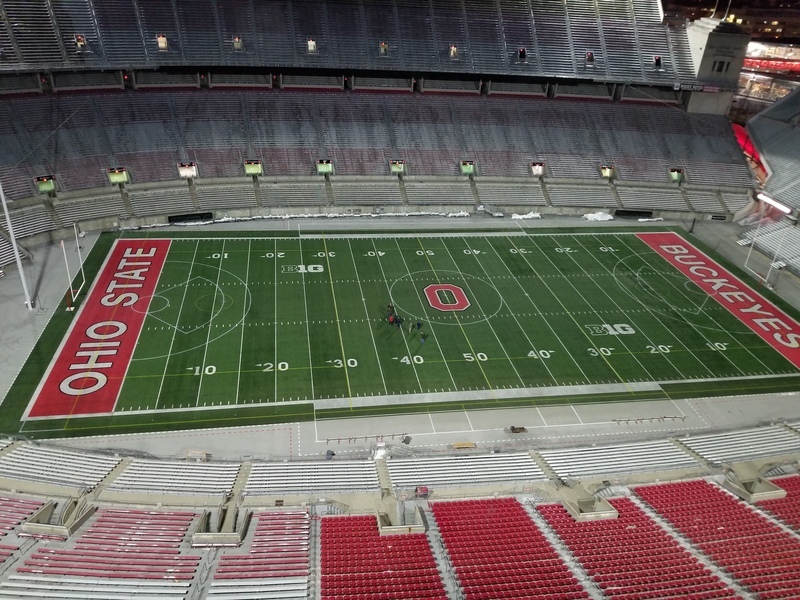 The Industry Reception at Ohio Stadium to “Kick-Off” our event was very well attended and seemed to be enjoyed by all. Even some folks from the “state up north” took their selfies in the block “O” at the 50-Yard Line. The speaker sessions this year included some outstanding industry speakers, as well as talks from the new ODNR Director, Mary Mertz, the new Chief and State Forester, Dan Balser, and an interesting presentation from Harbor Bay Real Estate Advisors on a Cross-Laminated Timber building project getting underway in Cleveland. 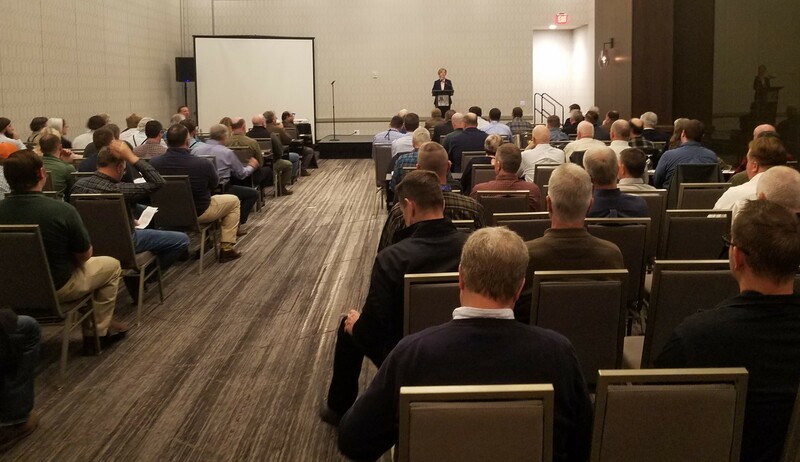 For the first time in several years, the Ohio Tree Farm Committee also provided landowner sessions in a separate track from the industry sessions during the afternoon. We will be making most of these presentations available on the OFA website in PDF format later this week. 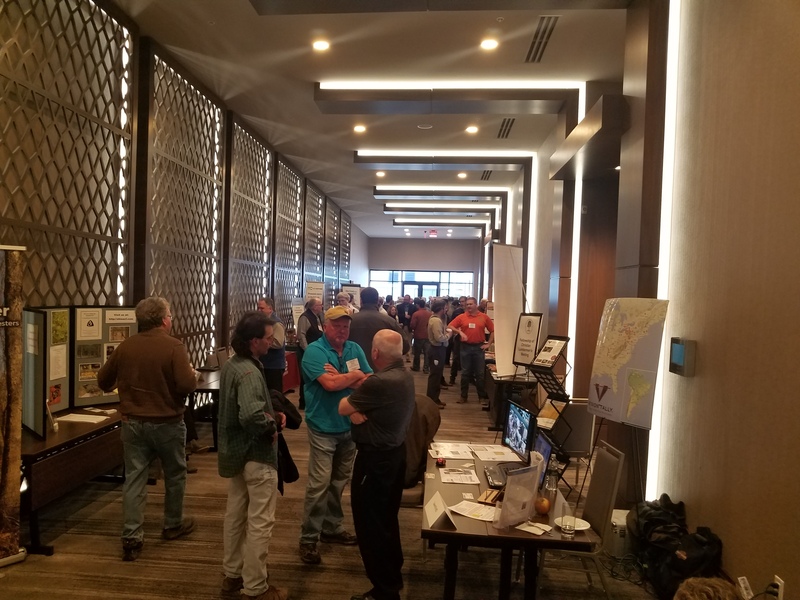 The exhibition hallway was filled with vendors, and we hope that the attending membership visited with them and conducted some quality business. 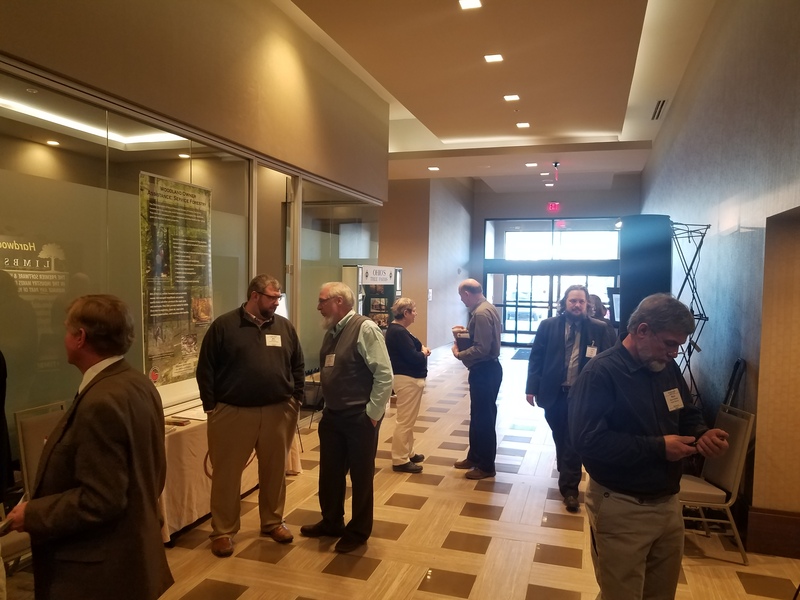 The Awards Luncheon was quite tasty, and there were many deserving individuals that received awards from both OFA and the Ohio Tree Farm Committee. The presentation by this year’s Tree Farmers of the Year, Paul and Joanne Meckling, was very well done, and one of the highlights of the show was getting a group picture of Ohio’s only National Tree Farmers of the Year, John Schmidt and Randy and Koral Clum. And for those of you that wondered why I didn’t take the microphone down to the table for 98 year old John Schmidt to give the invocation, he insisted on coming up on stage. I really think that he just wanted to show off that at 98, he could still climb stairs! It seemed that the Tree Farm Committee’s Silent Auction, Print Raffle, and Gun Raffle went well, and we thank everyone who supported their efforts. And, if you have participated in the Gun Raffle the last few years, you’ll understand my sentiment if I say that next year, we may save a few minutes of time and just hand over the first gun to Allen Troyer! Of course, our events like the Annual Meeting would not be as successful without the support of our sponsors and exhibitors. I would like to thank them and recognize them here. I also want to thank the OFA staff, Board Members, and other volunteers that help us put on a good meeting of the membership. I hope to see everyone again at the 2020 OFA Annual Meeting. The National Association of State Foresters' Forest Markets Committee releases a Weekly Newsletter full of all things Forestry and Forest Products Industry related. Each week’s newsletter has articles about: Forest Markets, Housing, Working Forests, New Products and Technology, and Renewable Energy. This week’s newsletter contains an interesting article about “fire-proof wood”. See the complete newsletters. The Ohio Division of Forestry is holding a workshop to educate professional foresters on legal issues affecting landowners and the consulting forestry profession. Attorney Thomas White and the White Law Office, will present the program material. The workshop will be held at Keim Lumber in the village of Charm in Holmes County on Friday, March 29, 2019. Registration deadline is March 25. See the flyer for registration cost and details, as well as the agenda of topics. This month, the Ohio Bureau of Workers Compensation will cover valuable employer program reminders and important dates, estimated annual premium letter, Safety Council Rebate Program, Ohio Safety Congress follow-up, July 1, 2019 rate reduction, changing your installment schedule or estimated exposure and their monthly safety tip.. See the following info from Ohio BWC to join the seminar in person or by webinar. Please join us for the March BWC employer webinar. This month we will cover valuable employer program reminders and important dates, estimated annual premium letter, Safety Council Rebate Program, Ohio Safety Congress follow-up, July 1, 2019 rate reduction, changing your installment schedule or estimated exposure and our monthly safety tip. The webinar will last approximately 20 minutes. You can view the webinar from the comfort of your office or attend in person at one of BWC’s service offices. By attending in person, you will have the opportunity to meet with a BWC representative. To attend the webinar but not visit a service office: Go to this page and find the class link. 11:30 a.m. Thursday, March 28. The following information on insurance markets affecting segments of our industry is provided by David Coil of the Hummel Group. The global and countrywide insurance industry regularly affects corporate risk management programs at a local level, especially from a coverage availability and rate (i.e. Premium) standpoint. 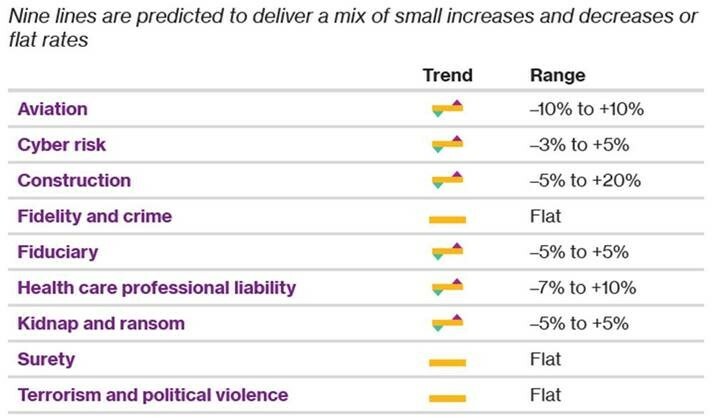 While there are many factors that affect how each individual corporate risk insurance program is rated, below and ATTACHED you will find documentation detailing trends forecast for 2019. 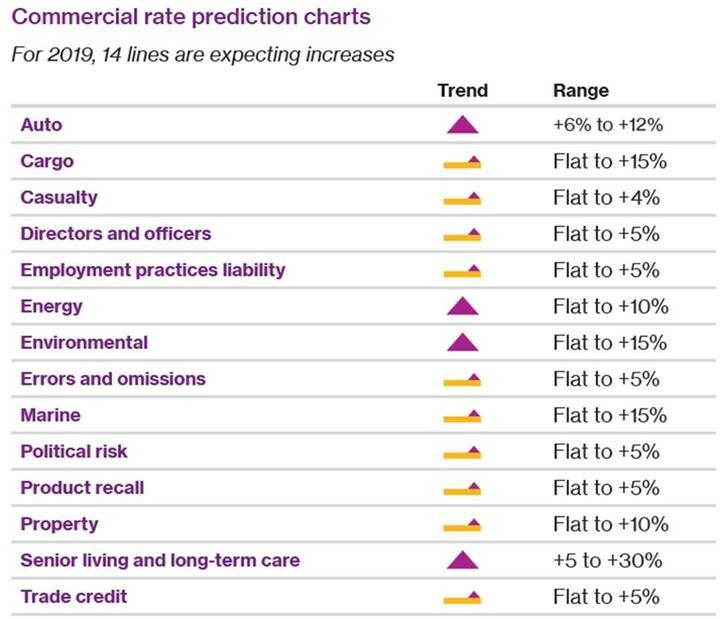 We are 60+ days now into 2019 and the forecasted industry rate inflations are clearly filtering down to individual corporate risk management programs, especially in the auto and property lines where the industry has taken incurred significant claims activity the past couple years.